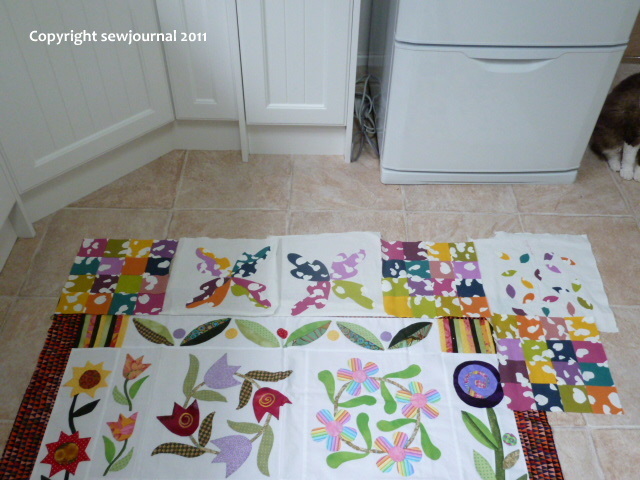 Do you remember my Splash of Colour quilt blocks that I was making with this gorgeous fabric? Well I was wondering how it would look around the Appliqué Sampler if I removed the border I put on it. So I had a play around. I’m still not sure. It’s a bit hard to see but I don’t think it works. I think it’s too airy to be a border. Mr Tiggy, who you can see presiding over the proceedings, in the top right isn’t convinced either. I agree, take the current border off the appliqué sampler, use a brighter and narrower border between it and the new border and the same as a final outer border and I think you’d have a fabulous quilt.